← The Perk’s Coffee Cafe Hulk Smoothie is blended with Vitamix! 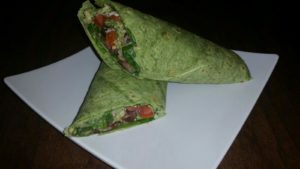 Stop by Perk’s Coffee Cafe and get a little healthier by trying our Veggie Spinach Wrap. The ingredients are our house avocado hummus spread, spinach, tomatoes, red onions, black beans and Monterrey Jack cheese perfectly tucked in a spinach wrap. It is delicious!